We have a thing for light gun games here in Games Revisited land, and what where would this site be without the biggest one of all time? 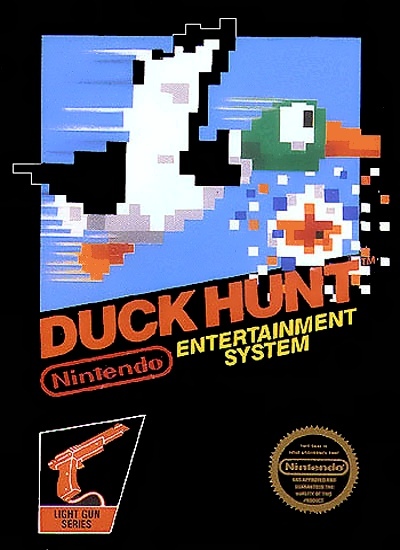 Duck Hunt is the 5th best selling game of all time, though it did piggy back on the 41 million selling Super Mario Bros, and to be honest? It doesn’t deserve such a lofty accolade. The game is simple, you get 3 modes. C) is Clay Pigeon shooting. You have to shoot a set amount of your targets in the round. If you are successful, you continue to the next level, if you fail, Game Over. It is that simple. This is it. This is the game. You might be able to tell, but I don’t really have much to say about Duck Hunt. So I’ll talk about the dog. He is your best friend, and your worst enemy. He’ll triumphantly inform you of your success. But miss, and you’ll be greater by the most harrowing noise in gaming history. 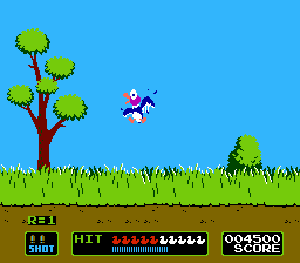 Duck Hunt did something simple, and it was alright at it. You can still enjoy playing it but in very small doses. There isn’t much longevity to the game, but if you can play for 15 minutes you’ll have fun. Play for longer and you’ll get very bored.